Gepost door My Scrambled Style op 7:30 a.m.
Hello, really cool images dear:) I like the first necklace. Wow this cola light is amazing! wauw die spiked ketting! LOVE it! Already following you! Follow back? Shoudl we follow each other? Love the coke light can! And your dog is adorable! You have some great jewelry. I love the spiked necklace. 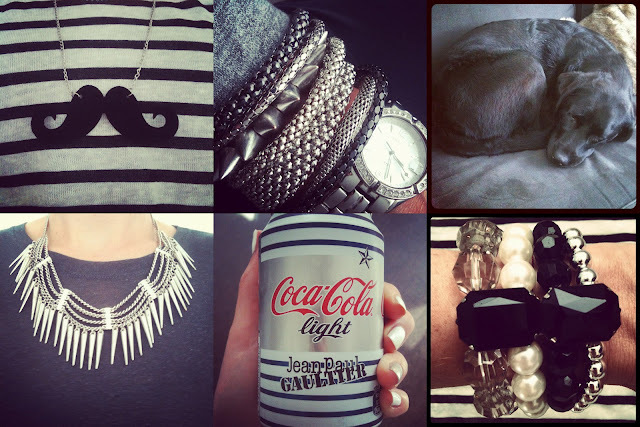 Love your arm party and we didn't have any jpg diet coke chic cans! Jealous!! great photos and cool pieces of jewellery! I'm at bloglovin now, I would love, if you join me their, too! Cute moustache necklace! Instagram always entertains me! great pics! Have a great week doll! Love the pictures! What u use to post them? I made a collage in Picasa. Yay Instagram rocks! I like your blog, is full of inspiration! Would you like to follow each other? Cute dog :-) Volgens mij zag ik die op Insta voorbijkomen? Ja, dat klopt. Dat is mijn lievie :-).